Like its predecessor, the Hyundai i10 is in the city car class, sitting below conventional superminis in a small, space efficient package. Hyundai's replacement for the slightly oddball Atoz benefitted from more conventional styling when it was introduced in 2008. Like its predecessor, the Hyundai i10 is in the city car class, sitting below conventional superminis in a small, space efficient package. Key to its appeal is Hyundai's good value pricing, comprehensive warranty and lengthy standard equipment list, the i10 typically having a more generous standard level of kit compared to its rivals. The i10 also arrived just when Hyundai was on a big product offensive, bringing new levels of quality, refinement and desirability to the brand. The i10 might be little, but it's actually quite space efficient inside. Tall and narrow, there's excellent head- and legroom front and rear. The i10 is only offered in five-door hatchback guise, the boot offering a capacity of 225 litres, which, while small, matches cars like the Fiat Panda and Ford Ka it competes with. Initially offered with just a 1.1-litre three-cylinder petrol engine, the choice was doubled shortly after launch with the addition of a 1.2-litre four-cylinder option. The 1.1-litre develops 66hp, while the 1.2-litre delivers 78hp. Both are economical choices, with the smaller unit having an official combined consumption figure of 5.2 litres/100km and CO2 emissions of 124g/km. The 1.2 achieves 5.0 litres/100km and CO2 of 119g/km. The larger engine is an easier drive; for all the three-cylinder's enthusiasm to rev, it is slow, taking nearly 16 seconds to reach 100km/h from rest. That's fine in town, where the optional automatic gearbox (which slowed it even more) works well too. Changes in 2010 saw the engines gain more power (not much in both cases) as well as improved equipment all round. On later cars the 1.1 is only offered with a five-speed manual, and the 1.2 only as an automatic. Trim levels are Active or Deluxe, the latter coming with such niceties as air conditioning and a multi-function steering wheel, though the i10 is rather nicely specified in any guise. The latest cars should still come with the peace of mind of having some of Hyundai's five-year warranty remaining. 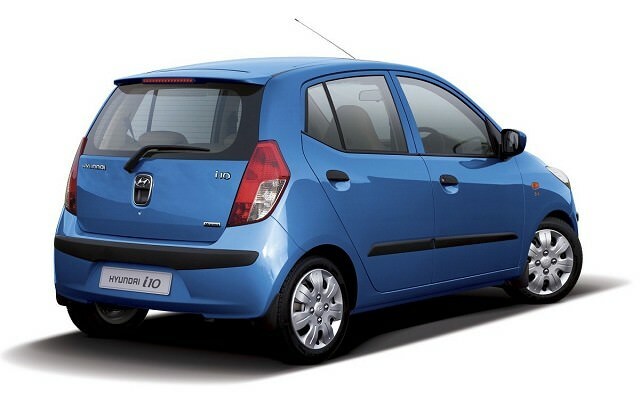 If you want your i10 for purely urban driving then the 1.1 is fine. However, the 1.2 version with a manual gearbox is a more rounded proposition, not feeling so out of its depth on longer journeys, and less taxing at motorway speeds. There's plenty of choice too, though later 1.2s are only offered with the automatic transmission. Hyundai used to be about 'pile them high and sell them cheap'. It has retained value at its core, but products like the i10 underline that it's now a mainstream choice. The i10 is a credible sub-supermini that's likable and capable - and decently equipped, too.